Need temporary storage during a move? Herlihy Mayflower has you covered – as Angela V. recently discovered. We offer warehouse and self-storage in Columbus and Chillicothe as well as Mayflower Portable Storage Containers (pods) in Columbus, Chillicothe and Athens, Ohio. Angela called on our Columbus moving office for help with a move from Canal Winchester, Ohio to Chillicothe, Ohio. We stored her furniture at our Grove City storage facility until she was ready to move into her new Chillicothe home. The Columbus suburb of Canal Winchester is an historic small city in Fairfield and Franklin counties. Founded in 1828, Canal Winchester was originally a port on the Ohio and Erie Canal. It is located midway between Columbus and Lancaster, Ohio on Ohio Route 33. Home to Herlihy Moving & Storage since 1920, Chillicothe is the seat of and only city in Ross County. Located along the Scioto River, the city has a population of about 22,000 and served as the state’s first and third capitals. To learn more, see our Guide to Planning a Move to Chillicothe, Ohio. After our Columbus moving team had finished unloading Angela’s furniture and other belongings at her new home in Chillicothe, she wrote to say how pleased she was with the moving and storage process. “Both crews took very good care of us,” she said. We appreciate the kind words, Angela, and wish you all the best at your new Chillicothe home. Looking for a professional, reliable = Ohio moving company serving Canal Winchester and Chillicothe, Ohio? Contact us today to experience the Herlihy Moving & Storage difference. As one of Ohio’s oldest moving companies, we have moved more than 100,000 families and businesses within Ohio, across the United States, and around the world. We’re BBB accredited and Angie’s List approved. 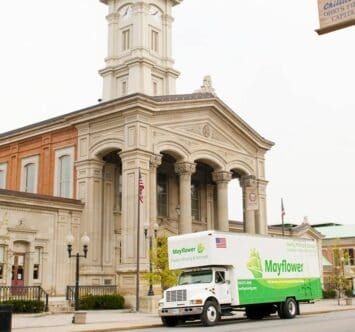 And, as a locally owned and top-rated agent of Mayflower Moving serving Chillicothe, Athens, and Columbus, Ohio, we have the resources to move you, no matter where you need to go.